SSH, or secure shell, is an encrypted protocol used to administer and communicate with servers. When working with a Linux server, chances are, you will spend most of your time in a terminal session connected to your server through SSH. While there are a few different ways of logging into an SSH server, in this guide, we’ll focus on setting up SSH keys. 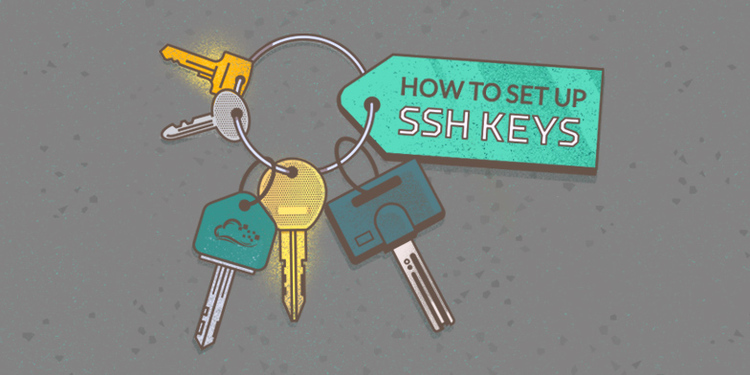 SSH keys provide an easy, yet extremely secure way of logging into your server. For this reason, this is the method we recommend for all users. An SSH server can authenticate clients using a variety of different methods. The most basic of these is password authentication, which is easy to use, but not the most secure. Although passwords are sent to the server in a secure manner, they are generally not complex or long enough to be resistant to repeated, persistent attackers. Modern processing power combined with automated scripts make brute forcing a password-protected account very possible. Although there are other methods of adding additional security (fail2ban, etc. ), SSH keys prove to be a reliable and secure alternative. SSH key pairs are two cryptographically secure keys that can be used to authenticate a client to an SSH server. Each key pair consists of a public key and a private key. The private key is retained by the client and should be kept absolutely secret. Any compromise of the private key will allow the attacker to log into servers that are configured with the associated public key without additional authentication. As an additional precaution, the key can be encrypted on disk with a passphrase. The associated public key can be shared freely without any negative consequences. The public key can be used to encrypt messages that only the private key can decrypt. This property is employed as a way of authenticating using the key pair. The public key is uploaded to a remote server that you want to be able to log into with SSH. The key is added to a special file within the user account you will be logging into called ~/.ssh/authorized_keys. When a client attempts to authenticate using SSH keys, the server can test the client on whether they are in possession of the private key. If the client can prove that it owns the private key, a shell session is spawned or the requested command is executed. The first step to configure SSH key authentication to your server is to generate an SSH key pair on your local computer. To do this, we can use a special utility called ssh-keygen, which is included with the standard OpenSSH suite of tools. By default, this will create a 2048 bit RSA key pair, which is fine for most uses. The utility will prompt you to select a location for the keys that will be generated. By default, the keys will be stored in the ~/.ssh directory within your user’s home directory. The private key will be called id_rsa and the associated public key will be called id_rsa.pub. Usually, it is best to stick with the default location at this stage. Doing so will allow your SSH client to automatically find your SSH keys when attempting to authenticate. If you would like to choose a non-standard path, type that in now, otherwise, press ENTER to accept the default. Next, you will be prompted to enter a passphrase for the key. This is an optional passphrase that can be used to encrypt the private key file on disk. The private SSH key (the part that can be passphrase protected), is never exposed on the network. The passphrase is only used to decrypt the key on the local machine. This means that network-based brute forcing will not be possible against the passphrase. The private key is kept within a restricted directory. The SSH client will not recognize private keys that are not kept in restricted directories. The key itself must also have restricted permissions (read and write only available for the owner). This means that other users on the system cannot snoop. Any attacker hoping to crack the private SSH key passphrase must already have access to the system. This means that they will already have access to your user account or the root account. If you are in this position, the passphrase can prevent the attacker from immediately logging into your other servers. This will hopefully give you time to create and implement a new SSH key pair and remove access from the compromised key. Since the private key is never exposed to the network and is protected through file permissions, this file should never be accessible to anyone other than you (and the root user). The passphrase serves as an additional layer of protection in case these conditions are compromised. A passphrase is an optional addition. If you enter one, you will have to provide it every time you use this key (unless you are running SSH agent software that stores the decrypted key). We recommend using a passphrase, but if you do not want to set a passphrase, you can simply press ENTER to bypass this prompt. You now have a public and private key that you can use to authenticate. The next step is to place the public key on your server so that you can use SSH key authentication to log in. If you already have a server available and did not embed keys upon creation, you can still upload your public key and use it to authenticate to your server. The method you use depends largely on the tools you have available and the details of your current configuration. The following methods all yield the same end result. The easiest, most automated method is first and the ones that follow each require additional manual steps if you are unable to use the preceding methods. The easiest way to copy your public key to an existing server is to use a utility called ssh-copy-id. Because of its simplicity, this method is recommended if available. The ssh-copy-id tool is included in the OpenSSH packages in many distributions, so you may have it available on your local system. For this method to work, you must already have password-based SSH access to your server. To use the utility, you simply need to specify the remote host that you would like to connect to and the user account that you have password SSH access to. This is the account where your public SSH key will be copied. This just means that your local computer does not recognize the remote host. This will happen the first time you connect to a new host. Type “yes” and press ENTER to continue. Type in the password (your typing will not be displayed for security purposes) and press ENTER. The utility will connect to the account on the remote host using the password you provided. It will then copy the contents of your ~/.ssh/id_rsa.pub key into a file in the remote account’s home ~/.ssh directory called authorized_keys. Now try logging into the machine, with:   "ssh 'username@111.111.11.111'"
At this point, your id_rsa.pub key has been uploaded to the remote account. You can continue onto the next section. We can do this by outputting the content of our public SSH key on our local computer and piping it through an SSH connection to the remote server. On the other side, we can make sure that the ~/.ssh directory exists under the account we are using and then output the content we piped over into a file called authorized_keys within this directory. We will use the >> redirect symbol to append the content instead of overwriting it. This will let us add keys without destroying previously added keys. After entering your password, the content of your id_rsa.pub key will be copied to the end of the authorized_keys file of the remote user’s account. Continue to the next section if this was successful. If you do not have password-based SSH access to your server available, you will have to do the above process manually. The content of your id_rsa.pub file will have to be added to a file at ~/.ssh/authorized_keys on your remote machine somehow. Access your remote host using whatever method you have available. If this works, you can move on to try to authenticate without a password. If you have successfully completed one of the procedures above, you should be able to log into the remote host without the remote account’s password. This just means that your local computer does not recognize the remote host. Type “yes” and then press ENTER to continue. If you did not supply a passphrase for your private key, you will be logged in immediately. If you supplied a passphrase for the private key when you created the key, you will be required to enter it now. Afterwards, a new shell session should be spawned for you with the account on the remote system. If successful, continue on to find out how to lock down the server. If you were able to login to your account using SSH without a password, you have successfully configured SSH key-based authentication to your account. However, your password-based authentication mechanism is still active, meaning that your server is still exposed to brute-force attacks. Before completing the steps in this section, make sure that you either have SSH key-based authentication configured for the root account on this server, or preferably, that you have SSH key-based authentication configured for an account on this server with sudo access. This step will lock down password-based logins, so ensuring that you have will still be able to get administrative access is essential. After completing this step, you’ve successfully transitioned your SSH daemon to only respond to SSH keys. You should now have SSH key-based authentication configured and running on your server, allowing you to sign in without providing an account password. From here, there are many directions you can head. If you’d like to learn more about working with SSH, take a look at our SSH essentials guide.